Day 1. Arrival in the morning at Ataturk Int. Airport, Istanbul. After customs clearance I will meet you on your way out of the airport gate at the international flights section. Today is the first day of our archaeology tour and we will drive towards the historical centre of Istanbul by the scenic road along the Marmara sea. On the way we will make a short stop at the ancient city walls built by Constantine the Great. 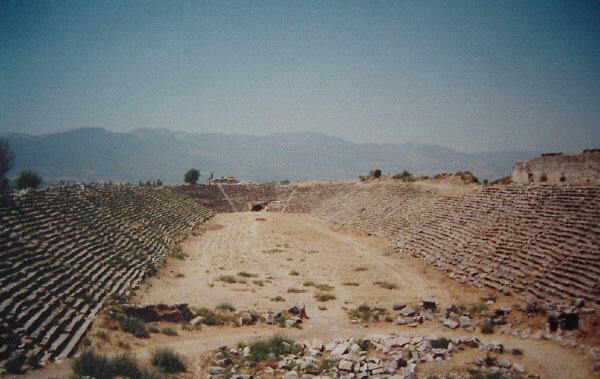 Proceed to the ancient Hippodrome where horse races took place in the Roman and Eastern Roman times. Continue to the Blue Mosque and see the interior of this masterpiece decorated with Turquoise and Blue Iznik tiles. We’ll continue to St. Sophia which was built as the main cathedral of the city in the 6th century, the building is the masterpiece of the Byzantine art. Continue to the Basilica Cistern which is the biggest cistern of the ancient city with 336 columns. Topkapi Palace, the main residence of the Ottoman Sultans is our next stop. Here, in addition to the treasury, the imperial council hall and the courtyards, we will also see the Ladies section with 412 rooms, all nicely decorated. Grand Bazaar with thousands of colourful shops is a good place to visit since it is not far. Staying overnight in Istanbul. Day 2. Istanbul – Dardanelles – Canakkale – Today is the day we hit the road heading towards Gallipoli. On our way out of Istanbul we will visit the Golden Horn area. In addition to the city walls we will see the small but magnificent Mosque of Eyup and the cemetery, and the cafe of Pierre Loti where the famous French novelist Pierre Loti used to write some of his novels in the early 20th century. 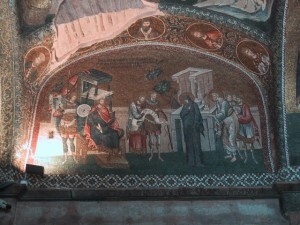 Our next stop will be the Byzantine Church of St. Saviour in Chora which is the masterpiece of the Byzantine art. After this visit we will proceed to Gallipoli, 350 km away. We will visit Gallipoli battle fields, the Anzac Cove, Lonepine cemetery, the 57th regiment cemetery, and the very high strategical hill called Chunuk Bair. We will take ferry to pass across the Dardanelles. This is a half an hour cruise and we will reach the Asian part of Turkey. Today we will visit Canakkale and stay there overnight in a historical building transformed into a boutique hotel. Total distance covered will be 375 km. Day 3. Troy (Trojan Horse), Pergamon. Troy is a very interesting archaeological site and it is famous around the world for the stories written by Homeros who was the father of poetry. Our next visit will be Pergamon where Pergamena (parchment paper) was invented. We will visit Pergamon, the Trajan temple, the famous library, the sanctuary of Athena, the theatre and the Altar of Zeus which was one of the seven wonders of the world in the Hellenistic period. Overnight in Pergamon. Today the total distance covered will be 280 km. Day 4. Ephesus – Priene. 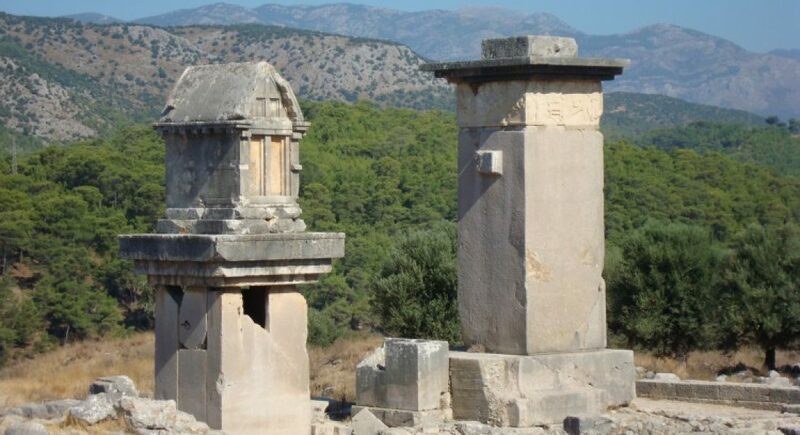 Drive to Priene, an outstanding ancient Ionian site where you will see an ingenious city planning designed by Hippodamus, the father of the modern city planning. Then we’ll see the Council Hall, the little Amphitheatre for the council hall, the temple of Asclepius and Hygeia, the market places, the famous Athena temple from the 4th century B. C. and the best preserved ancient Greek theatre which could accommodate up to 6500 people. We’ll proceed to Ephesus and will visit the ancient city and the Museum. After this we will continue travelling to Sultanhisar where we will stay overnight. Today the total distance covered will be 409 km. Goddess of love – “Aphrodite”. The apodyterium of theatre baths still have frescoes with paintings. The rain water draining system of the square in front of the theatre is also interesting to see. You will see the excavation mound behind the theatre, the twin agoras, the Hadrian bath and the bouleterion which was also used as a music hall from time to time. At every corner you will find Eros statues. This was the city of love where people came from faraway places to seek love of their loved ones and all kind of nudities were tolerated here. Women were walking around with nice dresses, yellow boots, jingling ankle bracelets and even with transparent clothes. All this was ended with the arrival of Christianity and when a bishop started to live here, whose palace you will see just before you get into the bouleterion. In order to erase the strong influence of Aphrodite, Christians changed the name of this town into Stavropolis, meaning the city of the Cross. The temple of Aphrodite dates back from the 1st century B. C. It is a peripteros temple since there is only one line of columns surrounding the temple, with Ionic capitals and it was transformed into a church in the 5th century A. D. The stadium here is the best preserved Roman stadium of the ancient times. It is from the 1st century A. D. and has a capacity of 30.000 spectators. In the temenos (sacred courtyard) of the Aphrodite temple lies the tomb of archaeologist Kenan Erim who carried out excavations here until the end of his life. The propylon or tetrapylon (the main entrance door to the holy courtyard of Aphrodite Temple) was restored by him with great care nearby where his body lies in a tomb with a white marble stele easily visible in the garden. 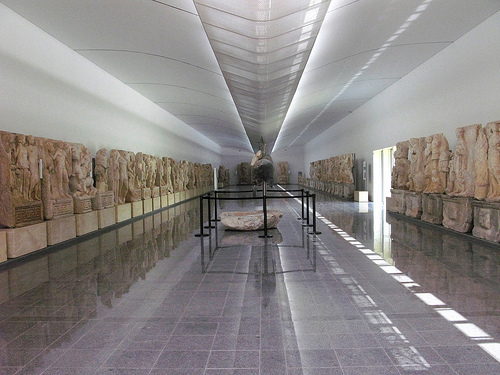 In the museum you will find exquisite objects, some of them dating back to very ancient times. The city is originally dating back to the 3rd millennium BC. In those times the city was called Ninoe. An oriental goddess which is known by her close affinities to Goddess Ishtar or A”star”te, (star) from the old Indo European language origins. The resemblance of this goddess to Aphrodite are particularly interesting. In Aphrodisias there was a school of sculptors and they were great artists who often created original works with their own imagination. You will find several statues of an extraordinary finesse and Aphrodite’s naked statues which represented the ideal beauty with her perfect measurements. Her statues are naked as representing the ideal beauty she had nothing to hide as the most beautiful Goddess and a great authority in the love affairs of the people. In the middle of the new section of the museum beside the other artefacts you will find a unique example of a galloping horse, created out of the special local blue and white marble found in Babadag mines 2 km from the site. Many stories of the ancient Greek mythology are described here like a parade with statues, each one more beautiful than the other. Our next destination is Pamukkale where you will see thermal waters cascading from the heights of the hill creating white water basins with their calcium deposits. The ruins of the ancient city of Hierapolis will be visible from a distance here. Proceed to Yalvac which is a small charming town near the Egirdir lake which is the 4th largest lake in Turkey. We will stay at a hotel here. Today we will cover a total distance of 412 km. Day 6. Yalvac – Konya – Cappadocia. This morning we will visit an exciting ancient site named Anthioch in Psidia. In Anthioch in Psidia we will discover ancient temples, waterways, city walls and much more. Konya is which was the capital of the ancient Seldjukian empire is 155 km from Yalvac. In Konya we will visit the monastery where the poet and philosopher Mevlana created the sect of the whirling dervishes. Here we will see the cemetery museum with the tombs of the dervishes including the one which belongs to Mevlana himself. We will also see many artefacts created by dervishes which influenced Anatolia. We will talk about dervishes and proceed to a Medieval school “Karatay School” built in the 13th century by Seldjukians. Here you will see some of the outstanding tile works of Seldjukian Turks who also carried out scientific researches here, in this ancient school. Proceed to Cappadocia. Cappadocia is 245 km from Konya and on our way we will see several caravan hotels built by Seldjukian Turks on this ancient trading route where caravans travelled for several centuries. Staying overnight in Uchisar. This is one of the most beautiful locations in Cappadocia region. Several valleys will be lined up under your feet and Erciyes mountain of 3916 m high is visible when the weather is clear. The total distance to be covered today is 415 km. Day 7. Cappadocia – Early wake up for Hot Air Balloon – Underground City – Fairy Chimneys – Dervish Ceremony at Sarihan Karavan Hotel from Seldjukian times. No worries we will do all of that and even more. If you have children I guess they will enjoy a hike in one of the valleys here. Or maybe an Indiana Jones type of adventure in one of the underground cities? We will also have time to explore those mushroom-looking rocks, called fairy chimneys. Indeed Cappadocia is a fascinating area with all those stunning rock formations and rock dug churches decorated with beautiful frescoes. Goreme open Air Museum is where we will discover many of those beautiful churches where monks brought the Christian religion by means of the colourful drawings they created on the surface of the rocks. Day 8. Cappadocia – Hattusa – Ankara Today will be one of the highlights of your archaeology tour. We will drive to Hattusa in the morning, capital of the Hittites. Hattusa is 227 km, approx. 4 hrs. driving distance from Cappadocia. Here we will discover this fascinating ancient city of the mighty Hittite Empire. Hattusa is a world class site declared as one of the Unesco Heritage sites. Here I will tell you also about Hattis who were some of the most mysterious civilizations of the ancient world. Hittites who came here after the second millenium B. C. called their country the land of Hatti for several centuries. We will start our tour with Yazilikaya open air temple. So the road will turn right and take us to a dead end road where we will discover the open air temple. Here I will give you detailed archaeological information about the reliefs where you will get acquainted with several gods from the Hittite pantheon. After this visit we will drive a few more kilometers and will enter the territory of the ancient city which was surrounded with a fortification wall of more than 6 kilometers. We will visit the Great temple, Lion’s Gate, Sphinx Gate, King’s Gate and Palace. In the afternoon we will proceed to Ankara, capital of modern Turkey. The total distance to cover will be 435 km today. Day 9. 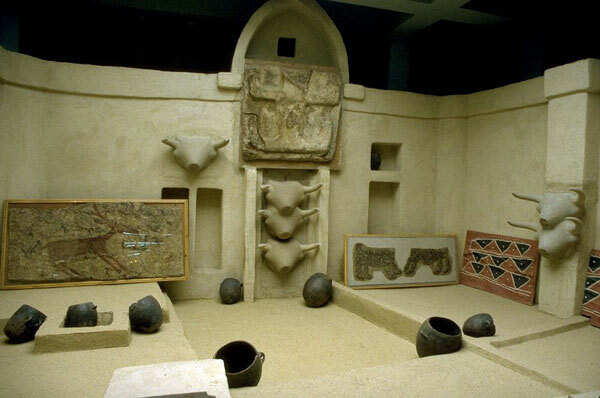 Today we will visit the Museum of Anatolian civilizations where I will give you several lectures in Neolithic, Chalcolithic, Early Bronze Age, Hittite and Phrygian sections of the Museum. This will be a great place to complete your tour. I will give a detailed historical overview of the civilizations who existed in Asia Minor. After the museum we will proceed to the Mausoleum of Ataturk, the founder of modern Turkey. Underneath the Mausoleum there is a nice museum which will make you familiar with the recent history of modern Turkey which was founded on the ashes of the Ottoman Empire. After this visit we will hit the road and drive back to Istanbul. We will have a nice motorway all the way through. Overnight in Istanbul . Total distance to cover will be 450 km today. Day 10. According to your flight schedule I will transfer you to the Airport. If there is still some time left we will have a cruise on the Bosphorus, down to Marmara Sea zigzagging between two continents, Asia and Europe. We may also visit one of the modern palaces, either Beylerbeyi Summer Palace located on the Asian side or the Dolmabahce Palace on the European side, both from the second half of the 19th century. This will be the last day of our archaeology tour and I will transfer you to the airport. We will say a sad goodbye to each other hoping to see us again one day in Turkey.